It was picked up by gawker’s blogs! Number five! Get it now while it’s on discount! Order placed and reposted to facebook, I was looking a bit ago and saw you on the best seller list at #5 for the day. Since it is only 10:44 EST I am truely hopeful to see a #1 beside the title and am sure I will. Best of luck sticking it to the man. Blessed Be. UP TO RANK NO.5 IN THE BESTSELLER LIST…… KEEP IT GOING!! NO.1 SPOT IS ATTAINABLE! Got a link to the sales rankings? I was wondering how it could have a lower rank in a subcategory (Literature & Fiction) than its rank for all books, and the answer is kindle editions. MoD is already the highest “normal” book in that list, but apparently the kindle-edition of the new Grisham novel was also released today – which could be an opponent one size too big (of course I’d love to be proven wrong). I wish I’d known about the anthology competition when it was happening, because as soon as I heard about the premise of this book my mind figuratively exploded with ideas for stories! I guess it serves me right for only enjoying comics on their own and not spending all my time on their messageboards. Not that I’d expect to have gotten in anyway, what with all the excellent authors who did, but still, it’s nice to dream. Anyway I already bought my copy and I hope to get it soon. Watch out, Keith. We’re coming. Your slip of paper says “too friggin’ much heroin”. Just bought mine. Go go go, little ranking! Can’t wait to read the book. Thanks for all the work you’ve put into it. We did it! Number 1! I ordered one. This just looked too intriguing to pass up. I owe it to Jeph Jacques for putting this on Questionable Content today. Came here from a QC link – this project is AMAZING. 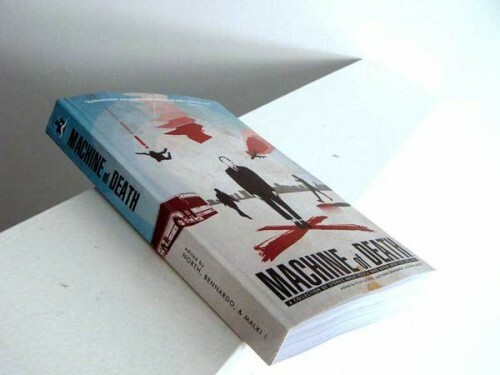 Congratulations, and I can’t wait to read Machine of Death. Got here through io9 and ordered immediately. We did it! It’s number 1! This little Internet anthology has officially beaten out Rick Riordan’s latest, The Girl With The Dragon Tattoo, the latest Diary of a Wimpy Kid… we DID it! oops, I slipped and bought that Glenn Beck book. My slip of paper say EMBARRASSMENT. Also #1 in fiction & literature if you go to the actual rankings page–beating the Grisham kindle edition. Well played, interweb dwellers. This made me happy. Have any of you actually checked far in enough into this. This well definitely be one of the best internet hoaxes ever pulled off. Very nice! Just ordered my copy!!! #1 and up 218,300 percent from yesterday!!! @OMG Considering the book is being promoted by multiple reputable people who make their livings off of the products they sell on the internet, I’d say your assertive statement is 100% false. Wheee! I’m glad they ship to the UK so I could join in. I hope somebody got screenshots and is going to write it up? Just ordered my copy (a day late I know)! Just a shame I wont get it for at least a month but by that time I might have forgotten that I ordered it and it’ll be a surprise! Yay for surprise books!! Self published books are self published for a reason. Don’t waste your money people. Bought mine today. Was still #1 on Amazon’s list. Can’t wait! Well, I can wait. I just don’t want to. I was going to wait for the free PDF. And then I saw the Randall Munroe and ERIN MCKEAN have stories included!!! I LURVES them! I hate reading books on PDF and love actual paper books. My fate was sealed. My copy of MOD was shipped today.